The location of California is shown in color on the map to the right. The State of California is bounded by Oregon on the north, by Mexico on the south, by Nevada on the east, and by the Pacific Ocean on the west. It is bounded by Arizona on the southeast. California is the 3rd largest state in the United States, covering a land area of 155,959 square miles (403,934 square kilometers). The state is divided into 58 counties. This California map site features road maps, topographical maps, and relief maps of California. The detailed, scrollable road map displays California counties, cities, and towns as well as Interstate, U.S., and California state highways. The pannable, scalable California street map can be zoomed in to show local streets and detailed imagery. to view a scalable California road map. The detailed California map and the regional California map display cities, roads, rivers, and lakes as well as terrain features. The detailed map shows only the State of California, while the regional map shows California and the surrounding region. California's capital city is Sacramento. Other major cities found on the California map include Los Angeles, San Francisco, and San Diego as well as San Jose, Long Beach, Fresno, Oakland, and Anaheim. In 2005, the population of California was estimated at 36,154,147, which is about 231.7 people per square mile. In 2010, California's population rose to 37,253,956 people. California is noted for its mild climate, severe earthquakes, and extensive freeway system. The state's primary Interstate Highways include I-5, I-8, and I-10, as well as I-15, I-40, and I-80. I-5 traverses the state from north to south; I-10 and I-80 cross the state horizontally, in southern and northern California, respectively. California is named after Califia, an earthly paradise in "Las Sergas de Esplanidian", a fictional work written by Garcia Ordonez de Montalvo in 1510. Along the Pacific Ocean in the west, coastal ranges run north to south; they are paralleled by the Sierra Nevada range in eastern California. Between these two mountain ranges lies the fertile Central Valley as well as the Sacramento and San Joaquin Rivers, which drain their waters into San Francisco Bay. The Mojave Desert and Death Valley are located in the arid southeast. Popular visitor destinations include Anaheim's Disneyland theme park, San Francisco's cable cars, and Napa Valley wineries. For additional California travel and tourism information, visit the official California tourism site and California Atlas. This online California reference map shows major cities, roads, railroads, and physical features in California. 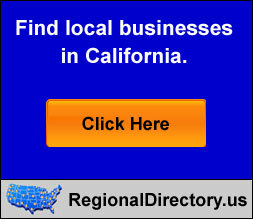 Several map publishing companies offer printed maps of California. For example, Omni Resources offers several maps of California that feature points of interest, airports, and parks, as well as selected local attractions and insets of major California cities. California-Map.org Editor, State Maps, PO Box 775, Barnegat, NJ 08005.